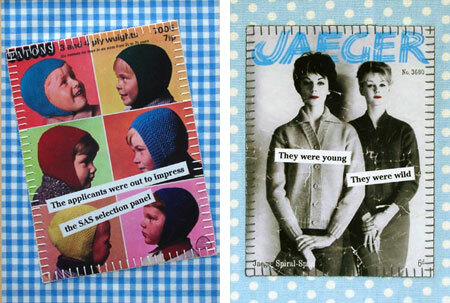 Catherine Colebrook cards can be found in the likes of The Art Group and Paperchase, but her vintage-inspired artwork can be bought with a click of the mouse. The Retro Collection mixes vintage images (the kind you might see in an old 50s or 60s magazine) with period fabric and a witty comment. All of which is mounted in an appropriate frame. And as I said earlier, you can pick them up online. Balaclavas (above) retails for £22, while the larger Young and Wild (in an oak frame) sells for £65.